At the Painted Chasm, in Chasm Provincial Park, near Clinton, BC, you can experience one of nature's wonders. 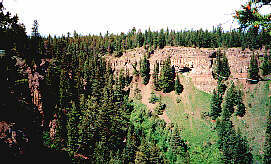 At the close of the Ice Age about 10,000 years ago, a stream fed by melting ice cascaded over a falls forming this chasm by cutting into some of the lava flows that helped to build the Fraser Plateau. Individual lava flows are shown here by the horizontal layering. When the glacial ice finally disappeared the flow of the meltwater stopped. The Painted Chasm is a brilliant display of bright orange and pink rock and a must see for sight seers. The 141 ha. Chasm Provincial Park is located 15 km/9mi north of Clinton and 4 km/ 2.5 mi off Hwy 97 in the Cariboo Region of central British Clumbia, Canada. 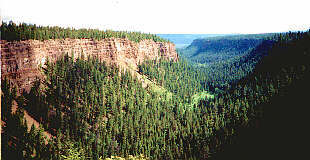 Chasm Provincial Park operates from June to September, and offers eight wilderness walk-in campsites. Picnicing and day use facilities are also available. Pit toilets are provided.